Anyone who has ever attended a wedding knows that the ins and outs can be stressful! Guests lists, menu selections, late replies, last minute cancelations…the list goes on. Oregon based couple Jen and Ian took a different approach this past January, choosing to smile from ear to ear and enjoy every minute in the lead up to their special day. Their relaxed, positive outlook on all things “wedding” resulted in a destination celebration that was pared back, brimming with fun and full of those memorable moments that will be treasured for years to come. Jen and Ian were keen to show their guests a good time and chose to kick the weekend off with a meet and greet at Los Tres Gallos in downtown Cabo San Lucas. Famous for its traditional Mexican menu and tasty margaritas, the get together got guests liquored up, well fed and mingling, before a (relatively) early night at host resort Sheraton, Hacienda del Mar. 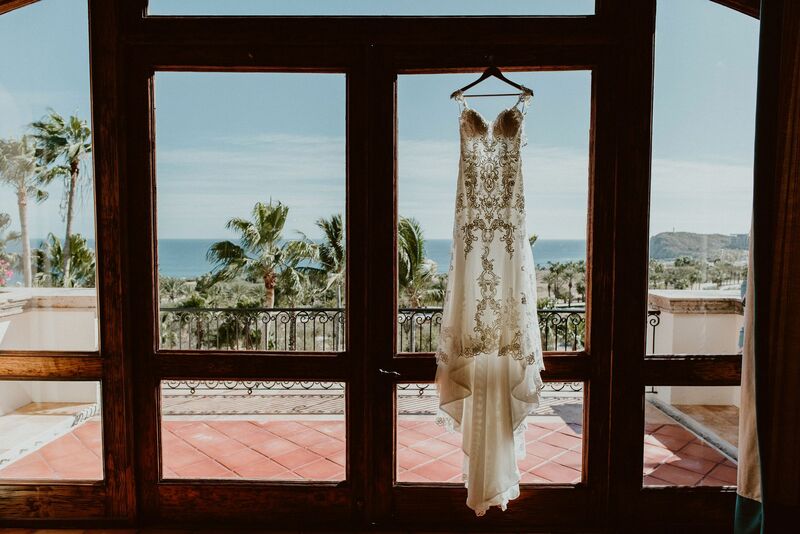 In the search for their dream location, the picturesque Cabo del Sol quickly spoke to Jen and Ian, and we signed on the dotted line with no hesitation. Located on the outskirts of Cabo San Lucas, the stunning golf course and clubhouse are prime real estate, boasting sought after, Hacienda style architecture and lush, rolling lawns overlooking the Sea of Cortez. 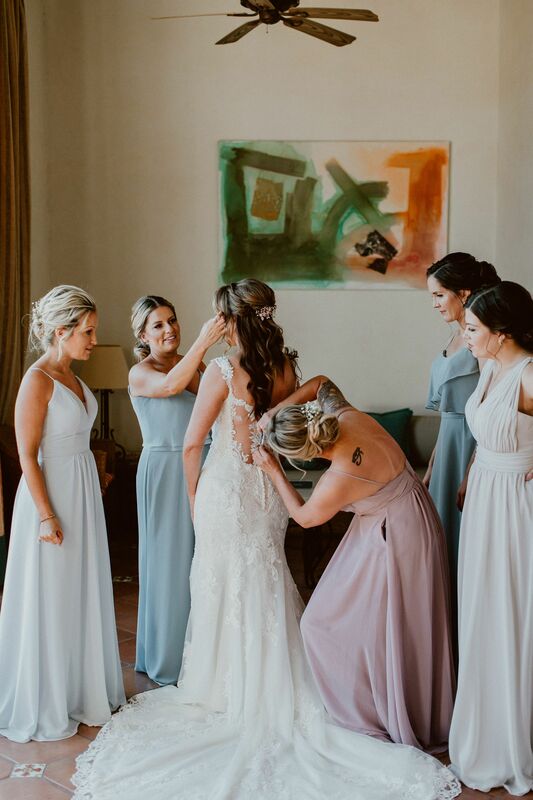 We arrived early to take advantage of the locations separate bride and groom’s “getting ready” suites, where the fabulous Alma Vallejo and her team were on site to attend to Jen and her girl’s hair and makeup needs. 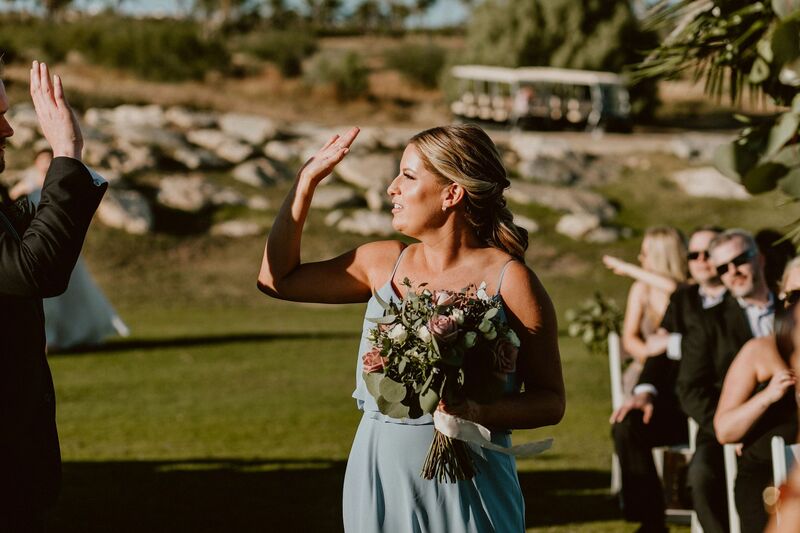 Our bridesmaids looked cool, calm and oh so Cabo in pastel blue, pink and white, but as always it was our bride who stole the show in a lacy white number edged with intricate button detailing and an on-trend circular train. Jen’s natural makeup and relaxed down do with soft curls completed her Cabo wedding look, and we knew Ian was going to be impressed. With preparations wrapped up, we met our photographers Ana and Jerome in Cabo del Sol’s main lobby. As Ian arrived with the couple’s adorable son Ryder in arms, the family shared a touching first look that had even us hardened industry experts welling up. What followed was a whirlwind of wedding home runs. 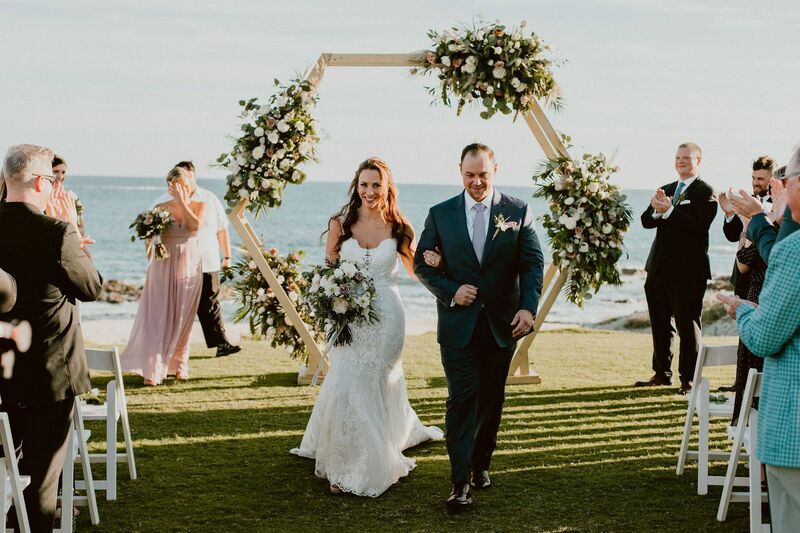 Jen and Ian’s short and sweet symbolic ceremony at Ocean Meadows took place before Emporio Arte Floral’s imposing geometric arch adorned with an abundance of tropical leaves, lush greenery and floral embellishments and Ryder very nearly stole the show in his baby shades! Post ceremony appetizers and cocktails quickly phased into reception time, where Jen and Ian’s 50 guests were met with a setup that exuded romance. 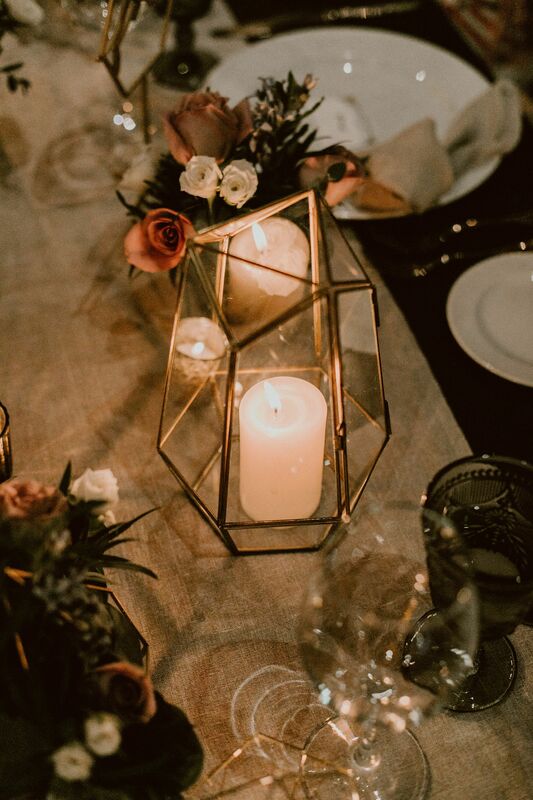 Long wooden tables, geometric lanterns, flickering candlelight and our favorite gold cutlery, along with carefully placed florals and signage, combined to transform Cabo del Sol’s clubhouse into a reception scape we simply can’t wait to publish. DJ Alex kept the mood just right throughout dinner, toasts and other formalities, before turning up the volume come party time! 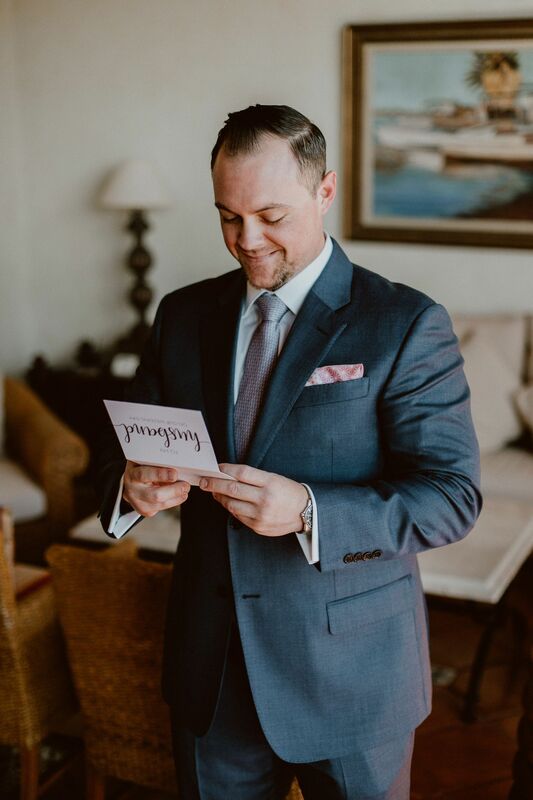 From Cabo Wedding Services a huge thank you to Jen and Ian for allowing us to play a small part in making your wedding dreams a reality, and as always, a very big shout out to Luz Maria and the wonderful team at Cabo del Sol for making our job all that much easier! Love it!! These types of blogs are amazing and give great ideas for other brides!